We hope to make a difference, to ease the suffering, to heal broken bodies and cure disease. As we start the day in the grass roofed, mud walled building we are using—the people from the village are already waiting patiently to be seen. It is 7 am—they have been there for hours. Hundreds of them are from that village, hundreds more from distant regions, hoping for a chance for the suffering of their children to be relieved. It is not unusual for them to travel several days—just for hope. We work hard and see as many as we can—but it isn’t enough. As the day turns to night, there are still hundreds that need help, that won’t receive it. 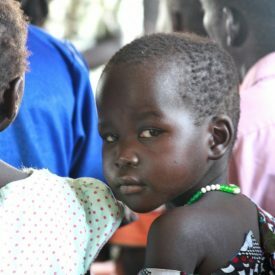 Our medicine is running out, as the malaria-ridden children still need us. I hold a child I cannot help, and my heart breaks as I tell mom through our interpreter that I am out of medicine, and out of time. It is a stark reality that strikes me—these children will not be here when we get back. Their frail, malnourished bodies will not survive the demands from the malaria. I hold a child I cannot help, and my heart breaks as I tell mom through our interpreter that I am out of medicine, and out of time. It is so important that we return—that we show them we care. They live for it—some lives are saved, some are changed, but everyone is given a chance. We gather at the well in this village that has been drilled with donations from people all over the world. Not special people, normal people like you and me, people that make a difference. The well changes everything by giving them a chance to be healthy for the first time in their lives. Most of the illness we have seen is directly related to parasite infested drinking water. We will do what we can, and then return. We have to.